I’ve been a keen angler for more than fifty years. I began fishing on canals and still waters in Merseyside and developed my technique by reading Mr Crabtree goes fishing and articles in the Angling Times. The best fish that I caught in my teens were a 4 ¼ lb perch (that I still think of as my best fish ever) and a 4lb crucian carp (although I now suspect that this may have been a brown goldfish!). As a kid, I earned extra pocket money over a number of years by tying trout flies for a local tackle shop. Despite selling a few thousand flies in my teens, I didn’t try fly fishing until I was 25; I was immediately hooked and this is now my favourite form of fishing. I find the peace and quiet of fishing in the countryside quite important, so I’m not naturally drawn to match fishing. 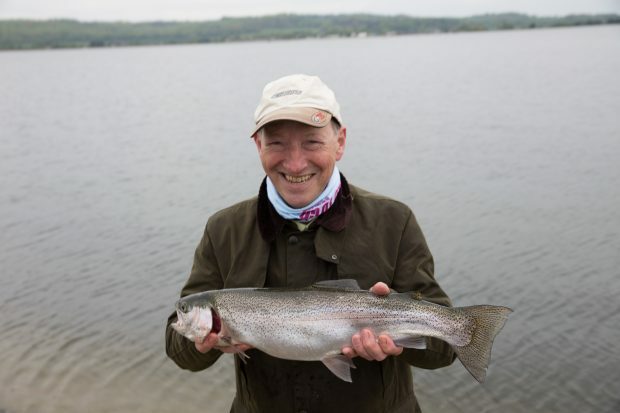 However, I do enjoy fishing with my colleagues once a year in the Water Industry Game Fishing Championships (WIGFiC); there’s great camaraderie both within the teams and between the teams that represent most water utilities, Environment Agency Areas and Natural Resources Wales. It’s a good time to catch-up and to compete in a friendly atmosphere. While I’ve been lucky enough to come 2nd and, this year, 3rd individual (at Farmoor), my proudest moment was when the team (EA Head Office) won the competition in 2009 at Fewston and Swinsty Reservoirs, Yorkshire. As an Environment Agency employee, I’m very proud of the improvements we’ve made in water quality over the last 30 years and how fish communities have benefitted from this. When I began my career at North West Water Authority, fish were largely absent from many urban water courses including much of the River Mersey; now coarse fish are thriving there and the salmon has returned. I was fortunate to be the Regional Fisheries Manager in the North West when the benefits of these improvements were first being realised; and it was a great honour to present the trophy for the first coarse fishing match on the Mersey at Warrington. One of the greatest new challenges that faces us is how to adapt to a changing climate. It seems increasing likely that summers and winters will continue to become warmer and this is particularly important to cold blooded animals like fish. Cold water species like salmon and trout are likely to suffer while warm water species like carp, roach and bream are likely to flourish. I have been working with partners in the Rivers Trust and the Woodland Trust to promote a programme called Keeping Rivers Cool. This project aims to reduce the warming of trout streams, particularly on hot summer days, by providing shade where it is most needed. Shade is provided by trees that are either planted or are allowed to re-colonise naturally behind stock proof fences. We have produced a map for rivers in England (hosted by the River Trust) that shows where shade might make most difference; we have produce a guide on how to apply the technique; and we have implemented a number of demonstration projects that show how the method can work on the River Ribble, River Wye, River Tyne and Hampshire Avon. So far more than 90,000 trees have been planted in these catchments. We are very grateful to the land owners who have allowed this treatment to be applied on their land. By working in partnership we can really make a difference!